Venezuelan opposition leader Juan Guaidó swore in on Wednesday night as interim president of the South American country. Several countries have indicated that they recognize the appointment. Hundreds of thousands of Venezuelans march through the capital Caracas on Wednesday evening. In the run-up to the protest, four people were killed, according to the Venezuelan police and the Venezuelan NGO Observatory for Social Conflicts. The 35-year-old Guaidó is the new president of the National Assembly, the Venezuelan parliament. The demonstrators hope that he succeeds in unifying the political resistance against Maduro. Guaidó announced when he took office at the beginning of the year that the parliament would ignore the president and on 11 January he appointed himself as interim president and announced that he would launch new elections. According to the Venezuelan Constitution, the President of Parliament may become interim president if there is abuse of power or a power vacuum. Guaidó tries to get the Venezuelan army to come by promising amnesty to soldiers who turn against Maduro. The Supreme Court, which declared the parliament unlawful in 2017, is also based on the president. The Venezuelan Public Prosecution Service is investigating whether Guaidó has committed criminal offenses. 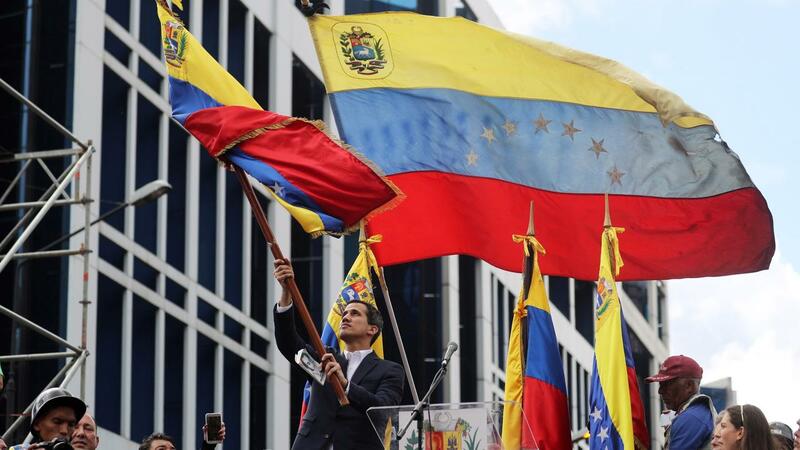 Guaidó is supported by the United States, the EU and other countries condemning the Maduro regime and questioning the legitimacy of the elections that gave him his second term of office. US President Donald Trump announced shortly after the swearing in to recognize Guaidó as interim president. Mike Pompeo, the US Secretary of State, says that Trump's government will ask Maduro to resign "in favor of a legitimate leader who reflects the will of the people". In response to these statements, Maduro broke diplomatic ties with the United States. American diplomats must leave the country within 72 hours. Maduro states that the opposition is trying to carry out a coup with the support of the American authorities, who in turn want to take part in the Venezuelan government. He has called in the help of the army to preserve "unity and discipline" in his country. Mexico was the only country of the so-called Lima group at the beginning of this year, a partnership between fourteen countries that recognized Maduro's new mandate. A spokesperson for the Mexican government says Wednesday night that no changes are being made to this policy at this time. Several countries of the Lima group have already announced that they will recognize Guaidó as interim president. These are Colombia, Paraguay, Brazil, Peru, Chile, Argentina, Guatemala and Costa Rica. Bolivia has indicated to stand on the side of Maduro. Venezuela has slipped further under the reign of Maduro, the successor of the socialist demagogue Hugo Chávez, who died in 2013, in a deep economic and social crisis. Economists expect inflation in the country to reach 10 million percent this year. The economic crisis has caused major shortages of food and medication and a large flow of refugees to neighboring countries. Mass demonstrations against the Maduro government also took place in 2014 and in 2017. In the latter year, 125 people were killed in collisions between demonstrators and security services.